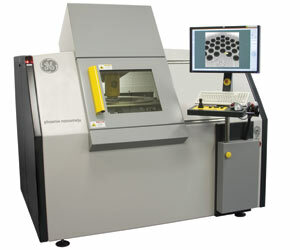 The phoenix nanome|x is an ultra high-resolution nanofocusX-ray inspection system designed for inspecting high-quality assemblies and interconnections in the semiconductor and SMT industries. The system offers excellent performance and versatility and can be used for 2D X-ray inspection as well as for full 3D computed tomography (nano ct). With the new x|act software package the phoenix nanome|x is the system of choice to ensure meeting actual and future zero defect requirements. Offering up to 30 frames per second, it provides outstanding brilliant live imaging and fast 10 second 3D scans.